Do you love visiting the beach now and then? Well, for most people there is something magical about the beach. The cool breeze, roaring sound of the waves and watching the sun go down at a beach makes us forget about the crazy daily schedules and work stress. We also get to see our children playing with the sand. While this is fun, you shouldn’t forget protecting yourself and your family. Strong sun, especially in summers, may ruin your experience at the beach. Besides sweating profusely, the Sun UV rays may harm your skin. However, with the best beach sun shelter, you can enjoy every moment at the beach. These sunshades are designed to offer a cool and comfortable place to sunbathe, change your clothes, and keep your belongings. 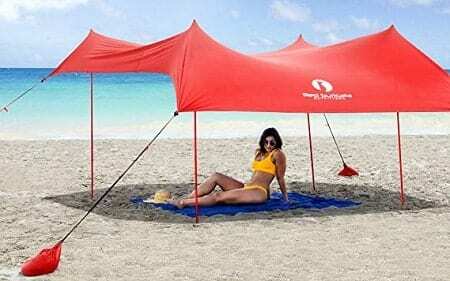 Beach sun shelters come in various sizes, designs, and functions. Here is a roundup of the best beach sunshades available on the market today. 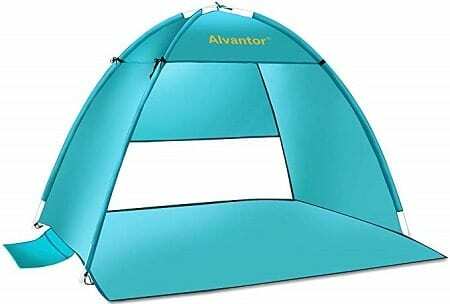 Designed to fit 2-3 people comfortably, Alvantir Beach sun shelter is a medium sized tent that comes at a reasonable price. Featuring a hassle-free, durable and water resistant canopy, this shelter provides a cool place for you to enjoy the beautiful views without the harsh sun. It comes with a self-popup fiberglass frame that doesn’t require any installation. To keep it secure, the tent comes with four sandbags to keep it in place. 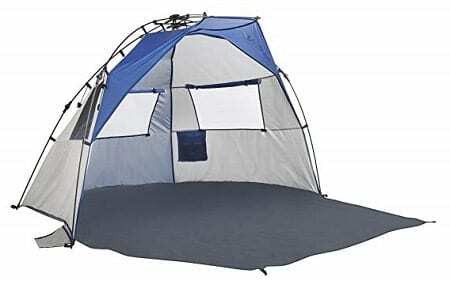 Despite the low price, this tent has been tested to withstand winds of up to 25mph. 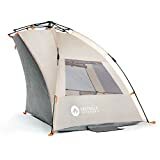 moreover, this tent comes with a breathable mesh window that lets in the cool breeze while the fabric is coated to keep you safe from harsh UV rays. Enjoy the cool breeze at the beach in a cool shady area with the Suricata sunshade. 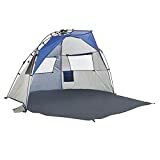 Different from other models, this tent has open sides for easy access. This design also maximizes the view of the ocean as well as beautiful surroundings. It offers a full height canopy increasing the shaded area for up to fifty percent. 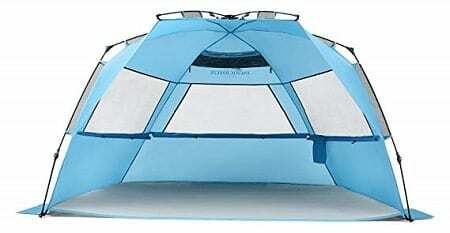 Not only that, this tent is built using tough fabric and lightweight, collapsible aluminum poles. The shelter is large enough to accommodate up to seven people lying down. What’s more, you are provided with a polyester carry bag as a bonus. Combining stylish design and innovative feature, this sun shelter from WolfWise helps to maximize your protection from the sun at the beach, parks as well as any outdoor space. With no assembly required, this tent pops up and folds down in a moment notice. Plus, the set up doesn’t need any tools. The ultra weight construction plus free carrying bag also makes it easy to carry anywhere. 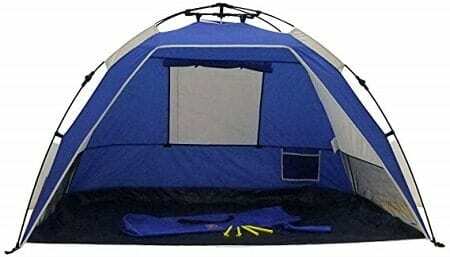 While the tent may look small, it has a large interior that fits 3-4 people while lying down. Similarly, this model comes with high-density mesh windows that do not only allow for proper ventilation nut also 360 viewing angles so that you don’t miss any action. More importantly, this tent surface is silver coated, blocking the harmful UV rays. Escape the excess heat and harmful UV light at the beach with the Easthills outdoors shader. What makes this tent stand out is its multipurpose use. Besides providing a cool shade at the beach, it offers complete protection from harsh weather elements. 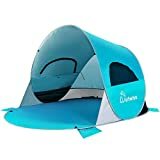 Therefore, whether you are thinking of visiting the beach, enjoying the view while camping in the mountains or having family time at a local park, this tent goes with you everywhere. It is made from 185T polyester and coated with UPF 50+ protection that blocks about 98 percent of sun UV rays. 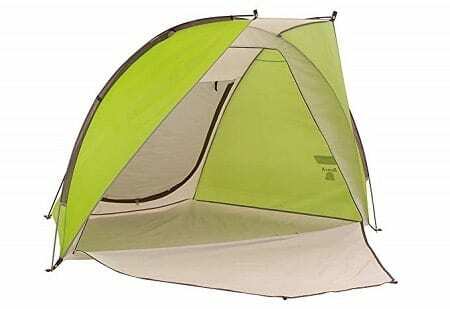 Additionally, this tent comes with internal pockets for storing your items as well three sided widows that rolls up for 360-degree views. Simplicity and versatility at its best! 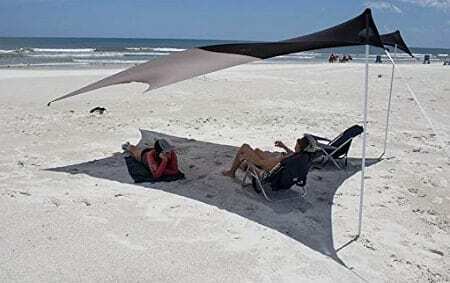 The Otentik Beach sunshade is a convenient and functional sun shelter that sets up within minutes. It features an innovative folding design, enabling you to take it with you wherever your adventures take you. What’s also interesting about this tent is that it is made from eco-friendly sport fabric, which is tested to provide UPF 50+ protection. Thanks to the simple design, you can set it up in your backyard, tailgating, camping, at the beach or any other outdoor adventure. Interestingly, this tent comes with an adjustable design that lets you move the poles easily to change the angle of the shade. 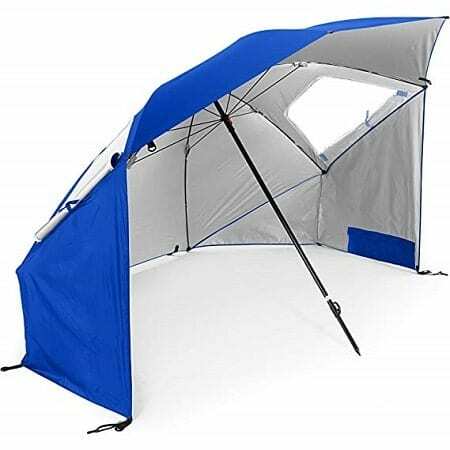 If you are not a fun of conventional beach tents, this beach and outdoor sun umbrella from Sport- Bella makes an ideal choice. Having been crafted from polyester materials, it ensures a dependable service that you will enjoy for many years to come. This large canopy is also water repellent and provides effective UV ray protection. Both sides of the umbrella are stacked to the ground using steel pegs. This offer much-needed stability against strong winds. Additionally, your purchase will also include a carry bag for easy portability. Simple, secure and beautiful. As easy as opening and closing an umbrella, you can set up the Genji sport beach tent in less than three seconds and fold it down in five short seconds. 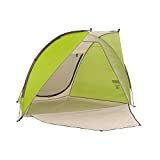 Another interesting fact about this tent is that it weighs less than five pounds. Therefore, you don’t have to worry about dragging something difficult for your outdoor adventures. Besides providing cool shade, the tent also blocks up to 98 percent of harmful UV rays. Unlike other shelters, that you will need to bring a mat along, this model comes with a waterproof PE floor. What’s more, it also comes with three inbuilt sand pockets and four stakes that hold it down securely against strong winds. 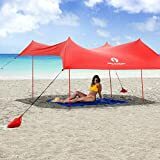 Perfect for beach sunbathing, picnics, as well as other outdoor activities, the quick cabana sun shelter deliver an immediate relief from strong wind and sun. Coming with a roomy interior and extended floor, two adults and kids can fit properly. We love its innovative inbuilt pile design that allows for effortless setup and take down. You simply need to press the hub together, and the shelter opens pretty much as a regular umbrella. Notably, this unit doesn’t have with separate poles, making the setup easier while still cutting down the weight. When it comes to portability, you are provided with a free carry bag that has ergonomic handles. Simplicity is the name of the game when it comes to Coleman Beach shades. Boasting of pop-up design, you will get to enjoy the cool breeze at the beach within minutes. 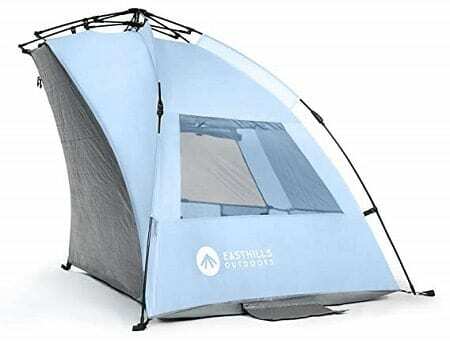 Besides offering you with ample shade, this sun shelter is crafted from UV guard materials that provide 50+ UPF protection Thanks to the sturdy polyguard materials, this tent is built to offer a reliable service, season after season. 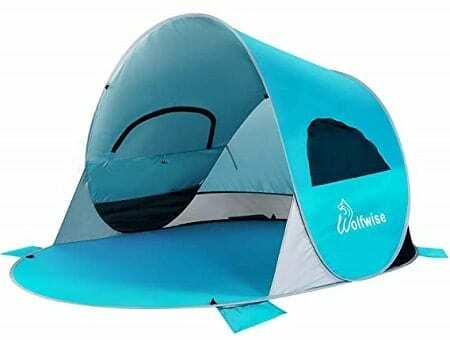 For added privacy, this tent comes with an extended floor that can be shut, making it a perfect place to change your clothes. More importantly, this unit comes with internal storage pockets that offer you a secure place to store your items as you sunbathe. It’s time to take your own shady and private space to your Favorite Park or beach with the Pacific Breeze beach tent. Coming with a patented closure, this tent has one of the easiest takedown and assembly you will ever find. It comes with a pivot design system that offers you with all the features you need to enjoy a cool shade with your family. Despite its extra-large design, it retains a lightweight design making it incredibly easy to carry. Its spacious interior can accommodate up to five people making it an excellent choice for a medium sized family or a group of friends. For enhanced privacy and convenience, the tent also comes with internal pockets where you can store your valuables. Are you still overwhelmed the choices available for the best sun shelters? Well, relax because we got your back. Below are some useful tips that help you narrow down your selection and pick a model that serves you right. How many people intend to use the tent? Do you go for outdoor excursions as a family or a group of friend? If that is so, how many are you? As you can tell from the products listed above, these shelters come in different sizes. Starts by thinking about the people who will be using the tent then make the appropriate choice. Some shelter comes with a waterproof floor while others don’t. Before making your selection, you should first have a clear picture of what you want to use the tent and where you want to use it. The floorless shelters are great for beach use only as they are cheaper. Another crucial consideration is construction materials. Besides ensuring that the materials are tough to withstand repeated abuse and strong winds, ensure that they are water resistant. It is also crucial to pick a fabric that is coated to block the harmful UV rays. Last but not least, ensure that the tent has adequate ventilation. For the best results, the shelter should have mesh windows on either side. This allows the natural breeze to get in and out, combating the warm temperature as well as heat exhaustion. Contrary to what many people believe, purchasing the best beach sunshade is not a hard task. However, you need to know what to look for before making the selection. Now that you are equipped with everything there is to know about this sunshade, we hope that it will be easy to make an informed choice. Simply go through the models and pick the one that suits your needs best. Happy buying!